When I was a young, first-time parent, I wanted to take the best care of my son I could. I did everything right; I did what I was told. I had him vaccinated on time, every time. Fast forward a few years and many vaccinations later, and he was teetering on the brink of autism. He had difficulty potty training and smeared feces everywhere, often. Friends thought it was funny; I thought it was awful to clean up. Still I didn’t see how alarming the symptoms were. He was delayed in speech and had trouble communicating. “That’s normal for boys,” everyone said. He shoved other kids down instead of playing with them. I needed to discipline him better, friends and family thought. He had meltdowns in despair and anger when things weren’t going his way and became inflexible about silly things like the color of his cup and which shoes he wanted to wear. Ok, I would just have to do things his way, all the time, I decided. Except one day I woke up, and realized something was really amiss and I couldn’t live like that anymore. Something had to give. Did the countless vaccines he received before the age of four (when I learned the truth about vaccines and how dangerous they really are) cause his autistic behaviors? I don’t know. I’ll never really know how much damage they did. If you’re still in the camp insisting that vaccines can’t and don’t cause autism, you can stop reading now because I’m not up for a debate. That’s not what this post is about. 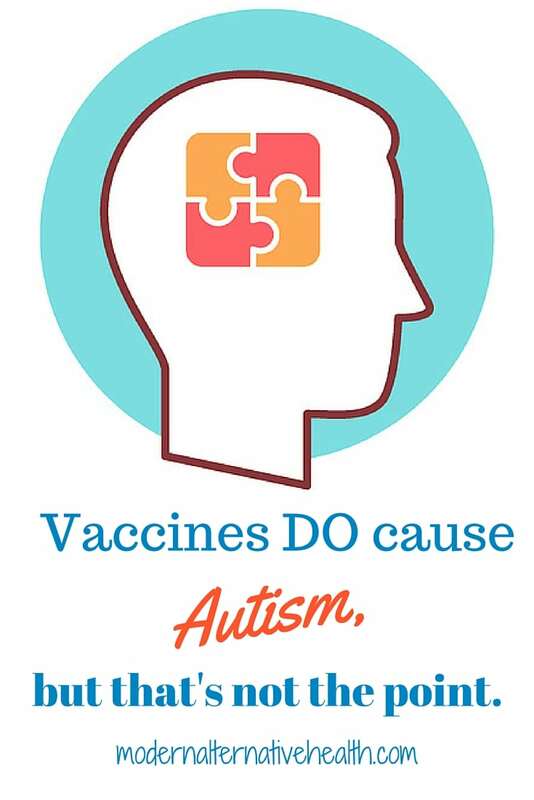 Since the CDC whistleblower scandal, it can no longer be denied: vaccines DO cause autism. But that’s not the point. No. No; autism is not a blessing. No. God did not create my son this way. He wasn’t born this way and these are not normal behaviors. I got lucky. We stopped vaccinating and began to reverse his symptoms before they got any worse, but there are millions of parents who have children with full-blown autism, and it doesn’t look like these romanticized ideals of savant children who are piano prodigies and artistic geniuses. Sure, those autism success stories exist. It’s pretty cool that because of the unique way an autistic person’s brain works that they can create some truly exceptional art. But those success stories are the exception, not the rule. What does autism really look like? Inability to toilet train and feces smearing, even into late childhood, teenage years, and, in severe cases, adulthood. Poor communications skills, or lack thereof. Lack of emotional expression. Imagine your child never hugging you or saying he loves you. Poor social interactions and lack of friendships and meaningful relationships. Meltdowns. Screaming, crying, throwing things, tearing things up, meltdowns. Self-injuring behaviors which sometimes require restraint. Hurting others with no remorse or understanding. Children with autism grow up to be adults with autism, who are nine times more likely to commit suicide than those without autism. Many of those with autism die before the age of 40. This is perhaps one of the most insulting and ignorant things a person can say, and would most likely not come out of the mouth of a parent who actually lives with a child with autism, particularly one who can link their child’s symptoms back to vaccines. 1. The odds of a child dying from a vaccine preventable (and I use that term lightly) disease are really rather quite low. Read Which is Safer: Vaccines or Illnesses? You may find that the fear tactics so many of us have bought into don’t actually hold as much water as you think. 2. This idea allows us to believe that kids with autism are just a little “quirky,” and that autism isn’t really that big of a deal. Let’s just assume that your child is not going to die from one of these vaccine preventable diseases. The odds, however, of your child being diagnosed with autism? It was estimated to be 1 in 45 in 2014. 1 in 45. Let that sink in. That’s up from 1 in 68 just a couple of years prior. The number is growing at a lightning speed. That’s millions of parents raising a child with exceptional difficulties: learning disabilities, social problems, and the physical symptoms that go along with it. Millions of moms exhausted and weary. Millions of families in distress. Millions of parents without any answers. 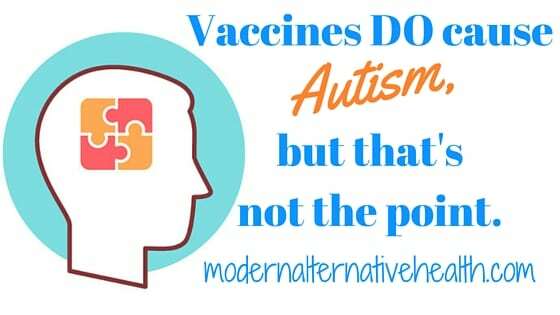 Whether or not vaccines cause autism, suggesting that autism is not that big of a deal and that vaccines are worth the risk would be a mistake. Risking my child’s health because you perceive it will protect yours would be a mistake. Not my child. Not anymore. When Jaclyn became a mom more than eight years ago, health food was the last thing on her mind, but when her oldest son began to struggle with behavioral problems early in life, she dove in headfirst to begin learning about how to live and eat naturally. Since then, her children have been healed of eczema and digestive problems and her own thyroid disorder has been healed. Best of all, her son’s behavior continues to improve as he heals through diet. As she continues to fight for her family’s health and well-being, Jaclyn focuses on GAPS-diet and Paleo foods with an emphasis on nourishing and healing foods like broth and homemade sauerkraut. You can find her writing about raising a healthy, happy family at www.thefamilythathealstogether.com. Autism is a big deal and so glad to see people like you speaking up about how difficult it is! It is an epidemic that needs to be addressed today. Please let me know where I can find some more solid info on the connection to autism if you believe there to be one! Have you read about the connection between autism and pesticides? I’d love to hear your thoughts! Thanks so much for your blog, I subscribed! This is an excellent post. I’m glad you stopped listening to the witch-doctors and started paying attention to your own experience and listening to your heart. These stories renew my faith that, no matter how powerful evil becomes (and make no mistake, our allopathic medical establishment is evil, serving death rather than life), good can win out in the end.